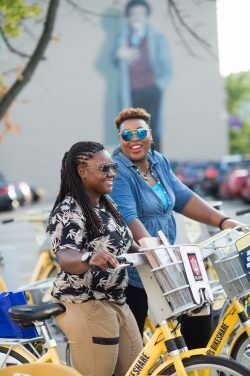 “EveryBody Rides” is a program of Indiana Pacers Bikeshare that provides access to all 250 Pacers Bikeshare bikes and 29 stations to every body regardless of age, ethnicity, gender or income level. We haves partnered with Indiana Housing Authority, Volunteers of America, and other low-income based organizations and residences located in close proximity to the bike share stations to offer subsidized passes for Pacers Bikeshare. Take a Group Ride with us! Already have a code? Sign up! Become an EveryBody Rides Ambassador! A generous philanthropic contribution from the Herbert Simon Family Foundation made the Indiana Pacers Bikeshare possible. The system is a program of Indianapolis Cultural Trail, Inc., and provides Indy visitors and residents alike an exciting, convenient and new way of enjoying downtown Indy. Learn more online at PacersBikeshare.org about how the system works and how to purchase your 24-Hour Pass or Annual Membership.